Why is there a slow uptake in green technologies in South Africa? Afterall, we have sun, wind and sea aplenty. 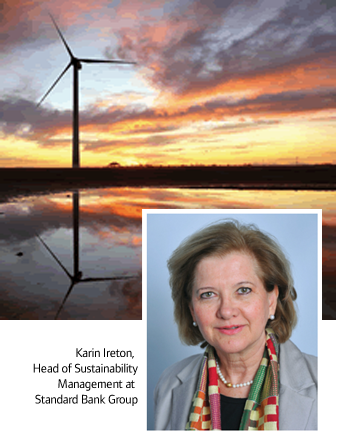 Karin Ireton, Head of Sustainability Management at Standard Bank Group, debates some reasons. “One of the major stumbling blocks appears to be the complexity of financing projects in municipalities and local government. As many of these green technologies are targeted at improving quality of life for the citizens (improved sanitation, solving pollution problems and harnessing alternative energy) they should be fast tracked. “But, low levels of experience with the technologies and the perceived complexity of the public finance rules, means that many developers walk away frustrated that their solution isn’t being considered. “We do need rules to prevent the misuse of public funds, but somehow, if we are to achieve the job creation ambitions of the National Development Plan, we need to enable municipalities to make better, faster choices. “In the commercial world we have seen how a good combination of clear regulation and political will can unlock private sector finance for 'cleaner' technologies. The Renewable Energy Independent Power Producers Project, which the [South Africa] Department of Energy launched is an example. “They set the target for independently procured renewable energy, set out the rules for tendering and pricing and unlocked private sector financing of more than R70-billion. Standard Bank Group responded enthusiastically and has financed a significant portion of the new wind and solar projects extending loans of more than R15-billion. "While the new coal-fired power station battles construction delays and significant cost over runs, the new smaller projects present disaggregated risk, much of it carried by the project developers not the public. There is already evident progress on the construction of these renewable energy projects, with the first delivery of energy committed to the grid early in 2014. When they are up and delivering it will hopefully build the confidence of the public at large and the Department of Energy in renewable energy. “It just makes one wonder why more home owners don’t think about solar geysers and gas for cooking. After the Johannesburg chaos last week those that did had fewer concerns about the city power chaos. They could at least shower in warm water and cook by candle light, which is much more fun than cold showers and takeaways. “For small companies too, particularly those with rooftop space, there are cost effective opportunities to reduce energy costs and increase their energy security. These projects can be funded in a number of ways and because they are not selling the power into the grid, but firstly supplying the property owners’ own needs, they don’t have the high transaction costs that accompanied the power stations. See www.standardbank.com/sustainability for more on how Standard Bank Group has responded to the need for renewable energy.